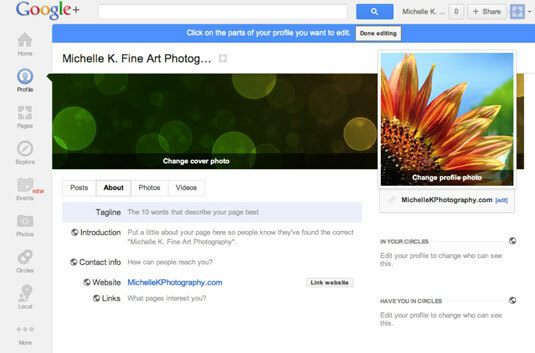 Sign in to your Google+ profile and click the Pages icon at the bottom of the left menu. Click the Switch to This Page button. You may be the administrator of more than one page. Be sure you click the button beneath the specific page you want to edit. On your page, click the Edit Profile button in the center of the page. The additional options you can edit to build your company’s brand presence appear. The default tab you land on is the About tab. Tagline: This is your company’s motto, a one-line, succinct phrase that sums up what your brand is about. If you don’t have a tagline already, brainstorm a couple of them to try or consider hiring a copywriter to write one for you. Introduction: Consider this the “About” of the About page; it’s what you want fans and customers to know about your company right out of the gate. This section can also state how long you’ve been in business and special awards or accolades you’ve received for your work. You can dress up your text with different fonts and links, too. Contact Info: The ways people can contact you, including landline, cellular, and pager numbers; your e-mail address; chat program names; your physical address; and your fax number. You can also choose whom to make this information visible to. 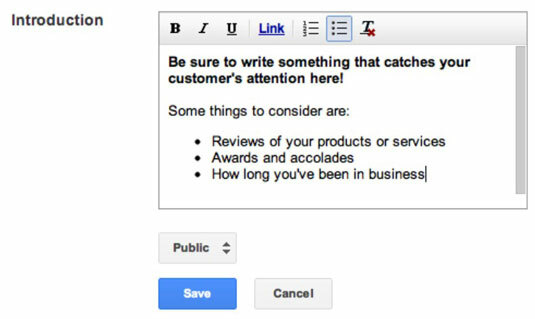 It is recommended you keep the default Public setting because you want current and potential customers to be able to reach you. Website: This is where you provide, you guessed it, your website address. You’re allowed to enter only one, however, so if you have more than one website, choose wisely. It is recommended trying different websites for a month or so and checking your analytics to see which one sends you the most traffic. To the right of your web address is the Link website button. You can click this button to get the HTML code to link your Google+ page to your website. Just copy and paste the code into the HTML code for your homepage. If you aren’t familiar with HTML, it is recommended you have your webmaster take care of it for you. Links: You can add other websites that are of interest to you. This is also a great place to add links to specific pages of your website that you want to draw attention to, without having them as your main website listing on your page. For example, if you were running a promotion, you could add the link to the promotion’s page on your website. Or add a complimentary brand’s site and ask for the same in return. This is a great way to get more exposure for your Google+ page and your company’s website. In Your Circles and Have You in Circles: These sections on the right side of the page allow you to change who sees the different people in your Circles, what Circles you share, and who can see what Circles you are a part of. You can make your Circles public so those who have you in their Circles whom you aren’t following in return can view your content. 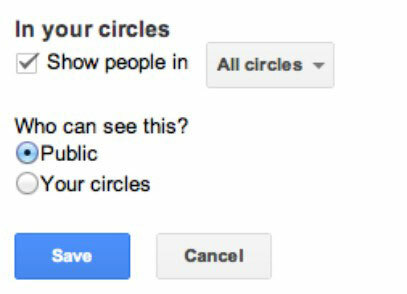 You can also choose to show only particular Circles. Showing others which Circles you belong to shows your fans that you’re actively engaged in your industry and community. No one likes an unsociable page on a social network. After you finish editing your page’s information, click the Done Editing button in the menu bar at the top of the page. There you have it! Your Google+ page is set up and ready to go!